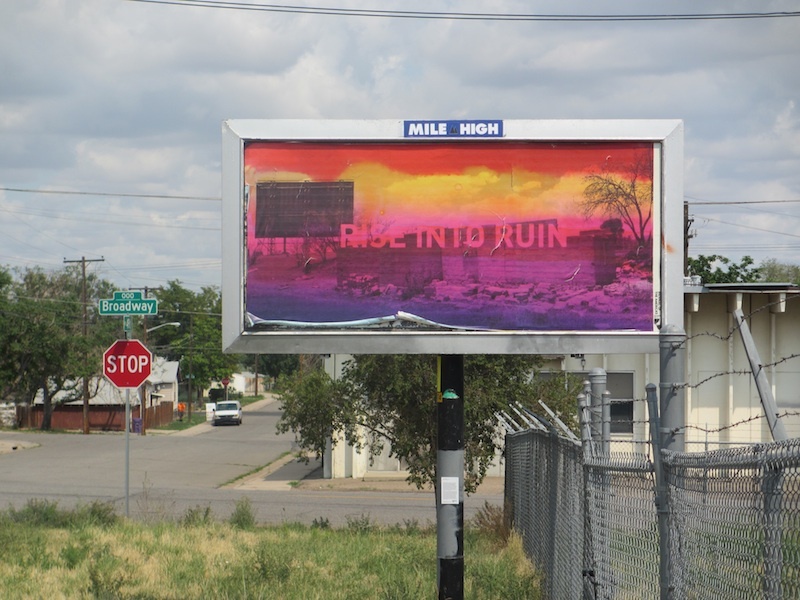 Denver’s billboard artists reflect on many dimensions of the contemporary urban condition. Accordingly, the Architectural Record opines that the artwork “feels scattered, both geographically and thematically.” But I think this depends on how you interact with it. Certainly, there are some compelling themes that connect the various pieces. And, in my experience, these themes are often enriched by the location and immediate context of the particular work. Minimally, the distribution of the art invites citizens to physically visit parts of Denver where they might not ordinarily venture. Indeed, this might be the most important accomplishment of the exhibit. This experience in turn suggests that the problems of the contemporary city are going to be a lot tougher to solve than these guys, this bunch, and the advocates of these paradigms, think. 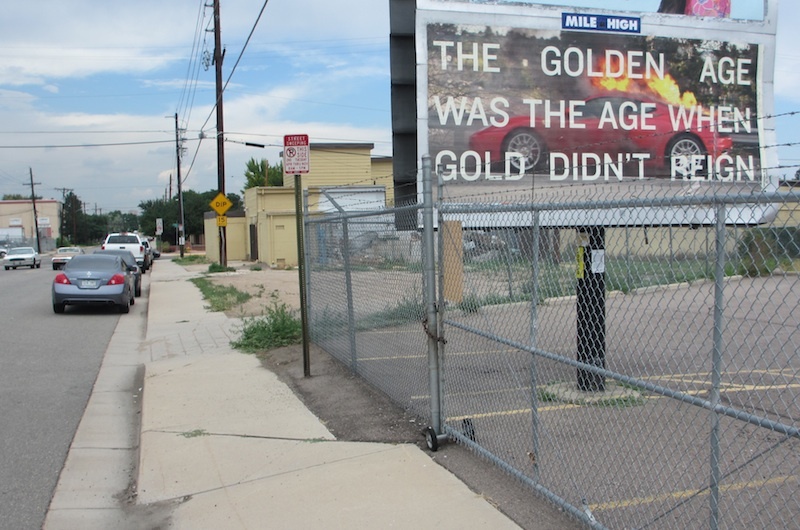 The piece works pretty well, especially on the increasingly dark and threatening day when I visited, and when framed against the backdrop of Denver’s remaining industrial center. …the urban ruin—including photographs of halted projects along Mexico’s highways. The image shows the opposite side of the billboard; that is, the backstage, riddled with chaos, detritus, and deterioration. Camil’s work, however, is imbued with a sense of hope, something that is reinforced by the vibrant colors. The phrase “rise into ruin” suggests the cyclical nature of the world, the phoenix that rises from ash to become, inevitably, ash again. 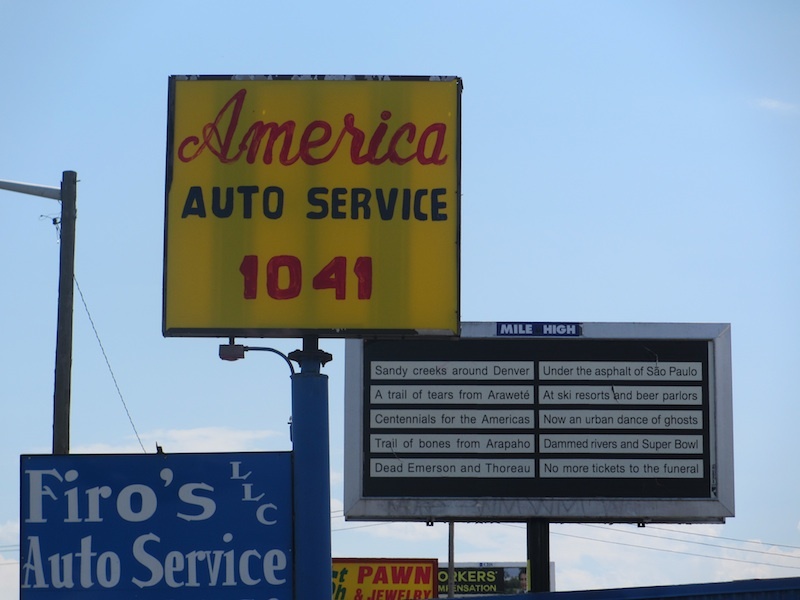 Domeneck’s poem follows a precise measure like downtown Denver’s city grid. It traces both the geography and history of the Americas, mixing the current locale with his native Brazil, illustrating subtle tensions. In the first two stanzas Domeneck jumps from one location to the other, juxtaposing landscape, histories, and cultures. With this hopping from one to the other, the trail of tears from the Araweté tribe can be located in São Paolo as well as in Colorado ski resorts, as if this violence can be seen and felt just about anywhere…By the time we reach “Centennials for the Americas” the poem slowly drifts out of a specific location to the idea of America, claiming that the transcendentalist thinkers Emerson and Thoreau are dead. Cars are a symbol of status and freedom in America. Nevertheless, they are also a necessity—in Denver, as in other American cities like L.A., an automobile is a basic requirement to navigate the urban landscape. Obergfell, then, seems to be calling for a change in the system of values—perhaps proposing that our values are entangled in places where they should not be. But questions arise: does reproducing text originally hand-painted on walls validate its claims when it is printed as a billboard slogan? Does it subsume it into a culture of consumption and spectacle? … takes the innocuous, a road sign at an intersection, and charges it with the political. Every city is replete with clues as to how it can be read, and Rozendaal’s photo—which has the name of the city where it was taken—exposes New Orleans as a city clearly divided by racial and religious lines…Rozendaal reveals the store of information that is hidden in plain sight but crystallized when reexamining everyday objects through art. 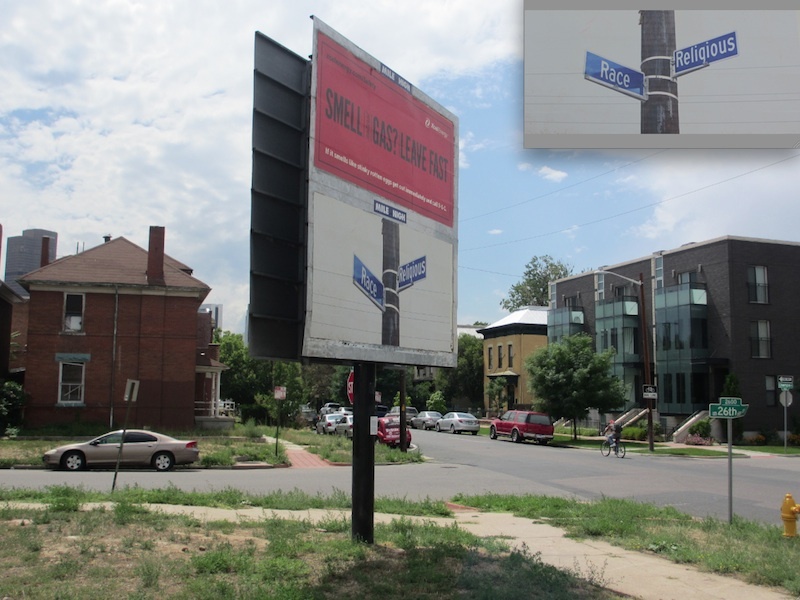 This particular piece is enhanced by its location in a vacant lot at the precise juncture of three electoral precincts within the Five Points neighborhood. 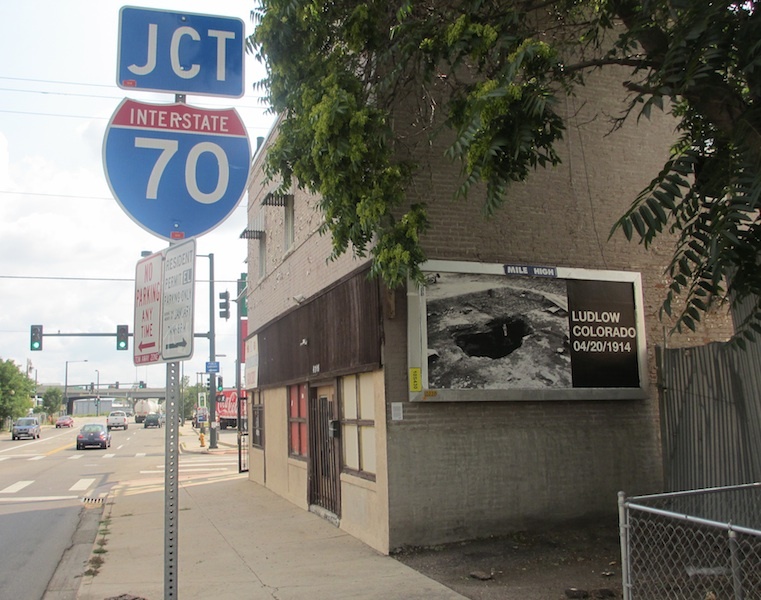 It draws additional strength from the opposition of a rehabbed apartment building to the right of the billboard and the dilapidated houses directly across the street on the left. Finally—and staying with the theme of popular insurgency—there’s this remembrance, from Steve Rowell, of the early 20th century working class struggle at Ludlow, Colorado. I’ve occasionally written about the Ludlow Tent Colony—now a National Historical Landmark marking the 1914 killing of striking immigrant coal miners by the state militia—on this blog because of what I take to be its relevance for theorizing, and tactically implementing, intercultural city ideals. Ludlow is now a ghost town and a sense of conflict and desolation is apparent in the photograph of a man [actually, a Colorado militiaman] inside an odd-shaped grave [actually, the tent cellar where the bodies of 13 suffocated women and children were found after the colony was burned in a militia effort to break the strike], with one hand jutting out…Nearly a hundred years later, Rowell reminds us that this struggle is still present. Rowell…aims here to convey a site of memorial through an economy of means. Ludlow is located on Brighton Boulevard just a few blocks south of Welcome to Detroit. Thus, it brings us back to the industrial heart of north Denver, and the related themes of urban struggle, ruin, and renewal. Like the other pieces, it draws power from its evocative context and/or associations. In this case, the piece is squeezed into a small, dark, cellar-like space between a Latino grocery store (there was a significant Latino presence in the southern Colorado coalfields both during and after the troubles of 1913-1914) and the fenced-in house next door. In conclusion, there’s lots to like in Draft Urbanism’s city-wide exhibition of artwork. There’s certainly lots of meaning for one to construct for oneself. Citizens and urbanists alike are richly rewarded by seeing the city in this way. A friend just forwarded me your blog posts about the biennial, and it was such a pleasure to read your thoughts on it. One makes these exhibitions and hopes that someone might take a longer look, but it is indeed a surprise when someone takes time to engage with the intellectual, aesthetic and urban ideas at play when we were making the show. 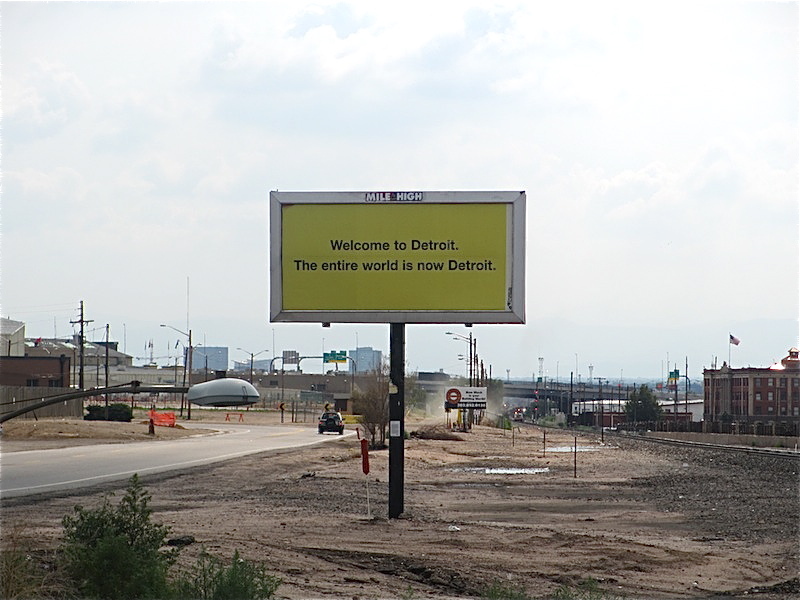 Thanks for noticing that the position of the billboards were contextually considered!